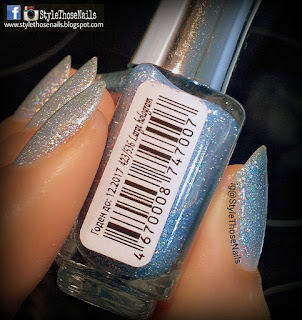 Large Hologram 423/536 is a gorgeous blue jelly polish with holographic microflakes. This is very sheer and needs good 3-4 coats to bring out full opacity but the good thing is it dries superfast. You can even apply it as a topper. After applying this polish you don't need any topcoat as it dries to a glossy finish. It also stays longer than normal polish, for me it remained chip free for 4 days and overall stayed well for a week. 1- Quite Sheer so needs more coats than normal polish.